The municipal campsite at Malestroit is situated next to the Nantes-Brest Canal – a pleasant, flat site set amongst trees and all for €5 a night for the two of us! We have yet to find an English campsite that cheap! Unlike some French campsites, this one did have separate male and female shower blocks, although Chris was rather amused to find a guy in his dressing gown shaving his head in the ladies washroom!! She did a double-take to look at the signage on the door to make sure she was in the right place! The French don’t get so hung up about privacy as we Brits do! We had decided to spend a day exploring the old medieval town of Malestroit, so the next morning we set off over the canal bridge on the 10-minute walk into the town centre. As we stopped on the bridge to look along the canal, we spotted two cycle tourists coming towards us along the towpath. Suddenly we realised it was the two Kiwis we had met in Dinan. What a coincidence! When we left them last they were heading for Rennes and we were heading for the coast. We had both changed our plans, so it was a real surprise to bump into them again. After a long chat, we wished them well on their journey along the Nantes-Brest Canal to connect up with the Eurovelo 6. Malestroit is an attractive thousand-year-old town, with cobbled streets and old timber buildings, some with strange wooden carvings, such as a bagpipe-playing hare, a sow in a blue-buckled belt, a man beating his wife…! The church is decorated with drunkards and acrobats outside – not quite what you’d expect on a church – but unfortunately was being restored at the time of our visit so was covered with scaffolding. The following day was bright and sunny and we headed off on the canal towpath towards our next destination, the town of Josselin. The towpath close to Malestroit was quite popular with day walkers and cyclists but very soon emptied and made for some very peaceful (and flat!) cycling. We had wondered whether cycling a towpath for some distance would prove a little boring, but we found the section we were on was interesting, with varied scenery interspersed with pretty lock-keepers houses. The towpath surface was of a very good standard, much better than some British roads, i.e. smooth and no potholes!! On entering Josselin, the first thing you see from the canal towpath is the famous ‘fairytale’ castle, which makes an impressive sight. Whilst I was trying to get my bearings, I was approached by another cyclist, who also happened to be English, a cycle tourist and, even better, was staying at the campsite we were heading for so was able to help us with directions! 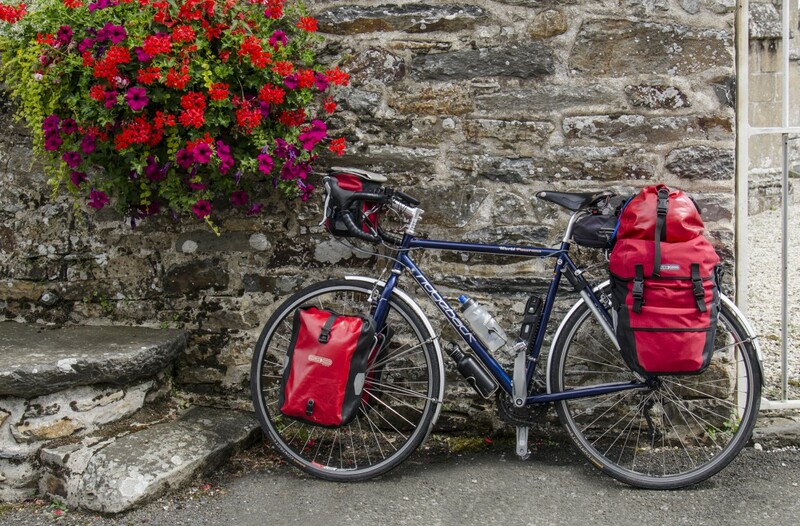 On booking in at the campsite reception, we were amazed to be followed by two French Canadians, one Australian and his American girlfriend, a couple from Tasmania and Pete from Chester (whom we’d met in Josselin) – all cycle touring!! All were heading in different directions and the Ozzie and his girlfriend were travelling on a tandem recumbent trike – an unusual-looking contraption – all the way to Istanbul. One of the most memorable things about cycle touring – and travelling in general – is the camaraderie you get when you meet like-minded people. We had a great evening listening to everyone’s travel tales, chatting about gear, bikes, routes, having a few drinks and sharing a massive pile of ‘frites’ outside the campsite bar in the warm evening sunshine. Delightful! We can thoroughly recommend this campsite at Josselin – Le Bas de la Lande. The facilities were very modern and clean and the owners were such a great couple, who couldn’t do enough to help you. The campsite even had a dedicated area for cycle tourists/walkers… with no cars! Categories: Bike, Camping, Cycle touring, cycling, France, Mike McEnnerney, photographer, Photography, PhotoLink Images, Tourism, Travel | Tags: Bicycle touring, Brittany, Josselin, Malestroit, Nantes-Brest Canal | Permalink. I love the photos, what beautiful scenery. I am looking forward to the next instalment of your journery. Thanks, Cath. Looking at the photos makes us want to go off again!